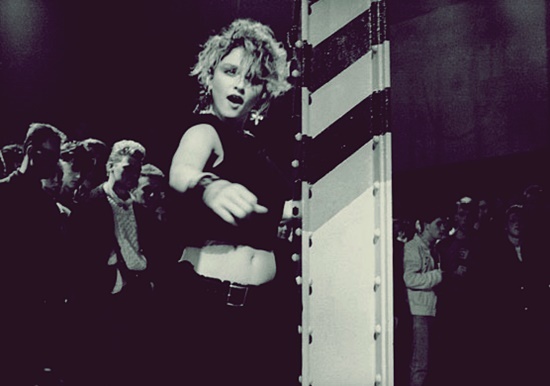 On January 27 1984, Madonna performed Burning Up and Holiday on the UK television program, The Tube. The show was broadcast live from The Hacienda club in Manchester. Malcolm Gerrie, executive producer of The Tube, has been quoted as saying that the show paid for Madonna to travel to Manchester because Warner Bros. didn’t yet consider her a “priority artist” and were unwilling to cover her travel costs. On January 27 1984, Madonna performed Burning Up and Holiday on the UK music program The Tube. The show was broadcast live from the Hacienda Club in Manchester. Malcolm Gerrie, executive producer of The Tube, has been quoted as saying that the show paid for Madonna to travel to Manchester because Warner Bros. didn’t yet consider her as “a priority artist” and weren’t willing to foot the bill.